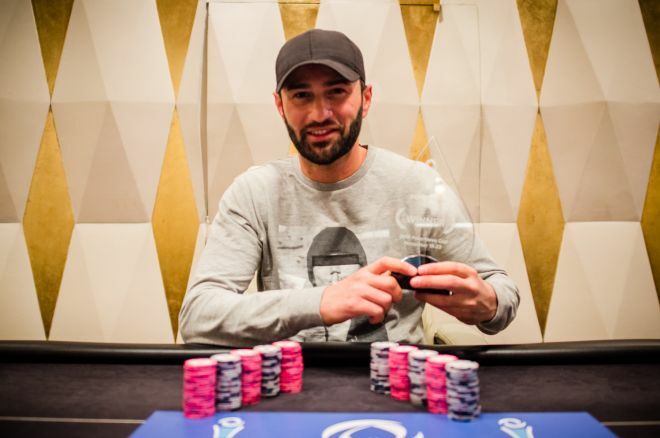 At the end of what will be remembered as the fastest final day in the history of the PokerNews Cup, Germany's Daniel Can left King's Casino in Rozvadov as the new Main Event champion, collecting €17,105 for the win and the coveted trophy. Can's victory came just about two hours into Day 3. As soon as the final table was formed, the nine remaining players agreed to a nine-handed deal and allowed the Sports Management and Communication student from Koln to exit the tournament room as the new champion of the PokerNews Cup. Chip leader at the beginning of Day 3, Can shared with PokerNews that his decision to agree to a deal with the other nine players came partially because of the tournament's structure and the way some hands didn't play out in his favor during the first level of play. I think a deal was the best decision to make. "I started as the day chip leader, but I found myself with a much smaller stack after two bad hands," he said. "The fast structure of the event and the stacks in play when we got down to nine convinced me that a deal would be for the best. I wanted to win the trophy and I knew that the high blinds would push some people to gamble rather than to play poker. I didn't want to get into a situation were everyone would just go all in." Despite some of those watching expressing mixed feelings about the deal, like Elena Litvinyuk, Can explained he based the decision on experience. "I think my experience in poker helped me to make the right decision," he said. "I've played live for 10 years and I think I can understand something about the game and recognize some particular situations. In that case, the deal was probably my best choice." Can's successful deep run, however, would not have been possible without the help of George Steiner and Fabian Grubler. "I think I need to give them a present now, as I probably wouldn't be here if it wasn't for them," Can said. "I discovered about the PokerNews Cup only on Saturday and when I saw a guarantee of €200,000 for a €250 buy-in, I immediately decided to come." However, with Rozvadov running at full capacity, Can wasn't able to get a room at King's and was forced to use one of the casino's partners in Germany. "The morning of Day 2, I didn't wake up on time and I missed the shuttle bus to Rozvadov," Can shared. "Luckily enough, George [Steiner] and Fabian [Grubler] were at the same hotel and gave me a lift. Thanks to them, I was able to come in just five minutes before Day 2 started. Without them, everything would have been different. I would have been late and I would have lost part of my stack because of that. I would have tilted and played hands I usually don't play. Luckily enough, things didn't go that way." A regular in Rozvadov, the new PokerNews Cup champion confessed to be a very good friend of King's Casino. "I have come here since the very beginning," Can said. "At that time, Leon Tsoukernik, [King's owner], used to organize €250 buy-in tournaments with a guarantee of €50,000 and everybody knew this would lead to big overlays because not many people played in Rozvadov. "The first time I came here to play in the €50,000 guaranteed event, I won it for € 12,896. I guess that's when I started to like this place a lot. I used to come here a lot, but now I am just back from a one-year break. I think when you play too much poker and for too long, you risk to get bored by the game, and that's a negative thing. Now that I didn't play for almost one year, I am adamant to get back at the table and get some action." Benoit Kuhn, the French member of the BKRF Investments team, finished just behind Can for €16,822. Kuhn came back to the tables at 14:00 CET after a long night spent getting some online action at PokerStars. *Denotes prizes were part of a nine-handed deal. Day 3 kicked off with 16 of the original 820 entrants to enter the event. Just a few minutes into the day, the field was down to 15 players after Germany's Jurgen Melan was all in with blinds at 40,000/80,000 and a 10,000 ante holding for 940,000 in chips. He collected €1,765 for the 16th-place finish after his hand was unable to improve once Christian Waldemar Dieter called with, . Straight after, many of the short stacks wound up getting all in to find themselves in a coin-flip situation. More often than not, the coin flips shipped the chips to the bigger stacks and narrowed down the field. The final table was reached on Day 3 in less than two levels after Sasa Klein (15th place - €1,998), Gerald Hiebler (14th place - €1,998), Gjergji Lazer (13th place - €2,289), Jakub Krämer (12th place - €2,289), Brian Joseph Lim (11th place - €2,697), and Robert Markus Manner (10th place - €2,697) were eliminated. Still yet to come is the PokerNews €85 Cooldown NLH Event featuring a €5,000 guaranteed prize pool. A decent turnout is expected as we have overheard a few players say they were going to enter the tournament that begins at 19:00 CET. Amongst those was PokerNews Cup Opening Event winner Timothy Weltner.